When was the last time you enjoyed a funeral? I did last night, at the funeral of Joe Dobbs. I arrived ten minutes before the service was supposed to start. Ron Sowell, the leader of the Mountain Stage band, was front and center with his guitar, singing a melancholy spiritual. At one point the song morphed into Amazing Grace, and everybody joined in. 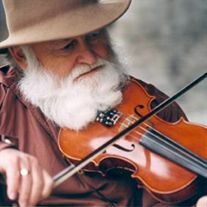 Joe Dobbs was the owner of Fret n Fiddle, a music store in my small little town of St. Albans, West Virginia, that attracted real musicians as well as rank amateurs like me. The kind of store where honest-to-goodness jam sessions take place. I didn’t really know Joe. My wife bought my guitar there years ago and I would stop in every so often to look around. I was too intimidated to pick up a guitar when Joe was around; too cheap to buy one when he wasn’t. I didn’t know his whole story, but his obituary filled in a lot of the blanks. The funeral even more. As tends to be true with musicians, Joe Dobbs lived a colorful life. After Ron Sowell finished, one musician after another came in from the make-shift “green room” and sang. After each one the audience – yes, we were an audience – applauded. A woman with a strong and unique voice led us in an a capella version of I’ll Fly Away. Twenty minutes later all the musicians returned, and led by Jim Snyder, sang Will the Circle Be Unbroken, complete with guitar, dobro, harmonica, autoharp, mandolin, and drum solos. A true musicians’ send-off. After that, friends and family told stories of Joe. Great stories. Unexpected stories. Again, I didn’t know Joe, but he would have loved it, I’m sure. Who wouldn’t? Air Force Chaplain Matt Lanham, a one-time student of Joe’s and former employee at the store, gave a beautiful benediction. And then one last song. In maybe Joe’s last surprise, he had revealed that one of his favorite songs was not a bluegrass standard, but Louis Armstrong’s classic, What a Wonderful World. A fitting end to a wonderful tribute. Footnote: I borrowed the photograph from Joe’s obituary. I’m sure I’m violating copyright laws and I don’t do that lightly. I would rather ask permission and give credit but I don’t know the photographer. But you had to see Joe. I’ve seen tributes to him all over my fb feed. It seems like SA just lost a treasure, but many lives were made richer because he was there. My sympathies to my home town and condolences to his family. Thanks for sharing this postlude.